Boy, are you in for a treat on Sunday, November 3rd! We have been working for months to plan this exciting event. The lodge staff will be joined by two special guests who will feed you amazing food and wine and satisfy your inner epicurean. A four course meal will be served in gourmet fashion with premium local wines. Each course will be prepared and presented by our expert guests. This is a sophisticated dining experience…in a remote cattle pasture. Al MacIntyre is our chef for the evening. Al holds an Associates Degree in Culinary Arts and has 17 years of kitchen experience. 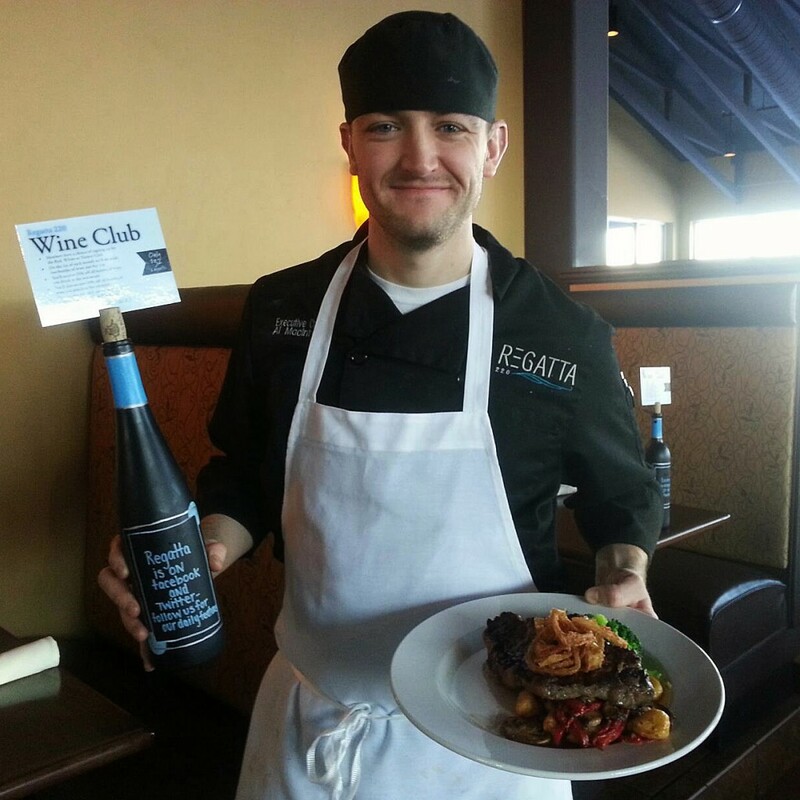 He has been Executive Chef at Regatta 220 in Green Bay, WI for 8 years. His specialty is ‘new American Fusion’ and he is the personal chef for several Green Bay Packers NFL football players. That is not all…he is a regional finalist in the U.S. Foods ‘Next Top Product’ competition. What is his entry? Fried Pickles. Yes. A pickle spear with monteray jack cheese in an egg roll wrap deep fried and served with wasabi ranch. Yes, please! 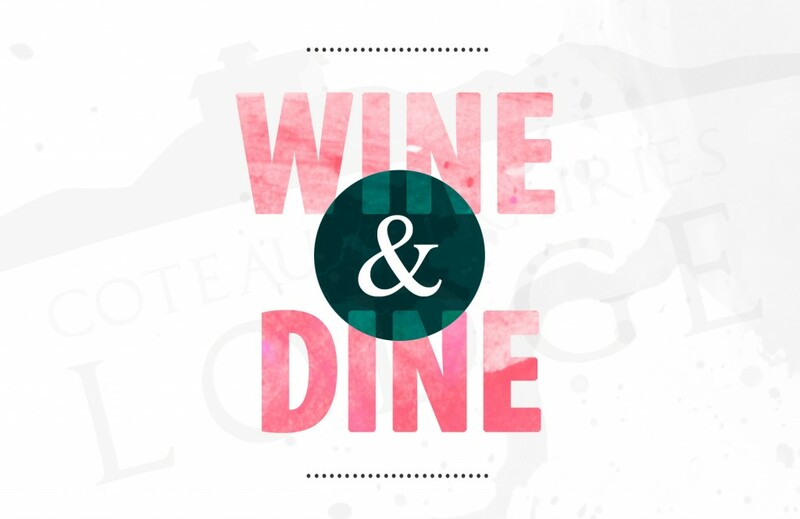 For our ‘Wine & Dine’ event, he has crafted a mouthwatering menu sure to please any food lover. Al will be in the lodge kitchen with his team to prepare the meal, and throughout the evening he will introduce each course as it is served. Rod Ballinger, our wine purveyor, has selected wines for the evening. Rod is the owner of Bear Creek Winery in Fargo, ND. 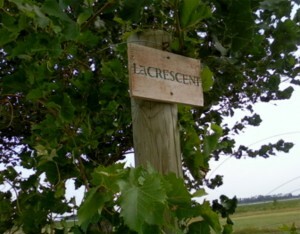 He has selected wine pairings for each course from his winery’s own wine list. 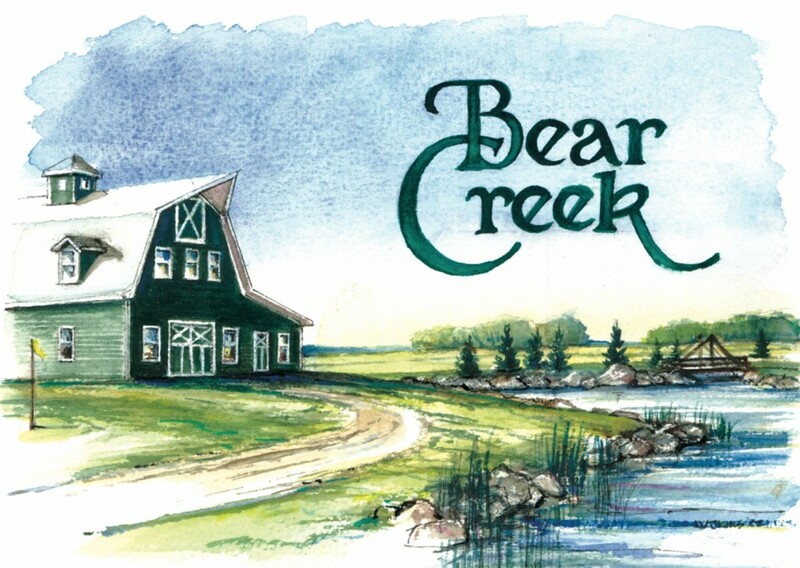 Bear Creek Winery is a winery and event center in Fargo where Rod operates a vineyard and makes wine. Rod, a true wine connoisseur, will introduce a wine with each course and explain the wine/food pairing. He will also describe the grape growing and wine making process he uses at Bear Creek as well as discuss the North Dakota wine industry and the grape variety development program he works with at NDSU. Maybe he will even tell some flying stories from his previous career as a pilot. The event is on Sunday, November 3rd. Everyone is welcome, but space is limited and meals are available by reservation only. Wine will be served only to those over 21 years of age. The price is $50 per person (ask for food-only pricing). 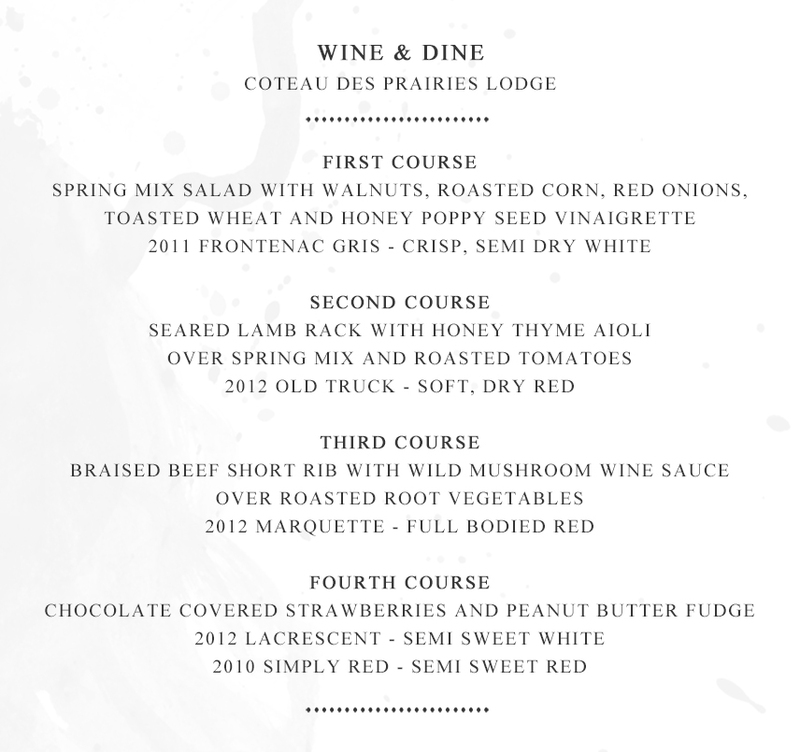 The meal includes a gourmet four course meal and a glass of wine served with each course. Water and coffee will be provided. Sodas and additional alcoholic beverages will be sold at the bar. Doors open at 4pm, guests are welcome to come early, tour the lodge and enjoy refreshments served at the bar. When you arrive at the lodge, sign your party in with our hostess. Guests will be seated for the meal promptly at 6pm. ***Special Promotion*** If you are coming out for the meal, why not stay the night? We will provide ONE FREE MEAL per room rental for those who would love to have the full lodge experience! Offer valid only for night of event. Rooms are $120 per night. The suite is $180 per night. My husband. November 4th is our 35th anniversary. What a way to celebrate!